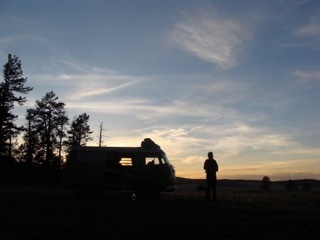 My first season on the San Carlos Reservation, pulling into the unexpected camp at the edge of the illegal dump, my new nest partner and I stood in stunned disappointment as the Game and Fish truck pulled away. The site was desert scrub nestled along an anemic creek. A single track of dusty road weaving its way beyond Peridot, Arizona through the dumping grounds of the Apache residents, past overturned easy boy recliners, skeletons of horses, Elmo suspended in a straggly bush. It was bleak. Anna’s face appeared frozen for a nanosecond, eyes glistening with teardrops ready to flood this barren landscape, her lips frozen slightly turned down as if a wounded child was ready to jump out and exclaim “the world is not fair”! That nanosecond passed and her face softened with a glint of confusion and surprise – shaken loose from the cold horror that surrounded us. And then, on cue we broke free of the chains of fear and had our first big laugh together. I was not joking when I said lamb. Miss pickle was stocked as if royalty was going on safari. We began to set camp in a postage stamp flat spot as far away from the main mass of the dump surrounding us. The talcum powder dirt road just twenty feet away. We were here. Our first eagle nest watch and there was no turning back. Anna is from Michigan. She is a biologist and especially brilliant with birds. She stands 4′ 12″ with long brown hair. Though having traveled and studied in various environments, this is her first taste of the Arizona desert. And to my surprise, perhaps both of our surprise, we picked each other at eagle orientation as partners to live and work together for the next three months. I managed to get this gig almost as a fluke. I am not a trained biologist. I am a left-brained trades person. But in the fall of my 47th year I discovered something missing while driving down the city streets of Tucson. I didn’t have a clue what I was doing here. And then I spied a pretty beat 1971 VW Westy parked in front of a dealership with a for sale sign. 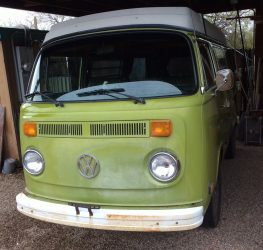 Mind you I wasn’t looking to buy it as I already lived with a precious 1978 named Miss Pickle. I just wondered why, whoever owned her, was willing to part with her? Inside the dealership of new fancy versions of the bug, and Jettas I did not expect to find a reasonable answer, but the side benefit of stopping to ask why became my journey to eagles. A salesman. Yep that is what I said – a car salesman was selling his old VW. I asked him if he ever really spent time in her, in the element of nature she was designed for. With that question, my life changed. His eyes lit up – it was like talking to a different person than the one before me dressed slick and ready to make a deal. He told me of a season he had spent monitoring bald eagles for the state of Arizona. Camping in some semi-remote desertscape, he was paid to keep an eye on one breeding pair of adult eagles. I had never heard of such a thing before. Someone… much less a bureaucracy, was willing to pay me to go camping? Within ten minutes, I had the skinny on how to get in on this gig. The flatness of my life was emboldened. Little foothills started to grow in my internal landscape. I had three days to obtain and complete a proposal for a bid opening as a subcontractor to the state of Arizona Game and Fish. After obtaining a packet of legalese, by convincing an administrative assistant in Phoenix to email me the packet vs. snail mail, (This was a task unto itself – for I was breaking the rules according to her), I sat down and poured over pages upon pages of department contractual obligations, and subcontract responsibilities, licensing and insurance. All this paperwork to go camping? Then it came down to the meat of the contract – the application. I was worried after reading the preceding jumble that the application was going to require massive documentation and experience and perhaps I was just being naive about my even being considered. Unlike many applications for jobs, this one did not require me to fill out my employment history. If fact, the whole application consisted of four questions. What kind of vehicle I drove, what camping experience and gear I had, what kind of similar wildlife biology experience I had and the final question was a response to a scenario of an individual(s) harassing an eagle or trespassing in a closed breeding zone. Three of the four information requests, I felt I had in in the bag. Even tho I never worked a field job, my voluntary bird counts with Audubon were the only field experience I could claim. No matter…you can’t win if you don’t play. So after agonizing over my penmanship and making three copies, and sealing it in an envelope, I had just enough time to drive to Phoenix and submit before the 3 p.m. deadline. Phoenix is only 90 minutes away – I could do it with my eyes closed, and so off I sped in Miss Pickle. It was a perfect fall day, windows rolled down, music cranking. It was a perfect… until I hit rush hour in Phoenix. It was only 2:15 and the game and fish office was only 11 miles away. Normally one would consider that enough time, but panic began to build as the traffic slowed to a crawl. Miss pickle and I never like being in rush hours in foreign cities but until this moment, I never knew how agile my van and I could be. The common mantra of all Westy owners was slow and steady. I jumped back and forth in lanes making a little better headway thinking i was a good, assertive driver. Perhaps I was not as good as I thought and perhaps people stayed out of my way since I was driving a big, green, steel machine. I managed to get to the Game and Fish office with minutes to spare. I ran thru the front door and asked loudly to submit my application only to be told I was in the wrong office. I needed to go across the parking lot to the overflow buildings and submit there. I turned on my heels and ran. Ran across the lot…the clock was ticking, dodged a truck backing out…the clock was ticking louder and rushed thru the front door of the mobile office. Flinging my arm across the counter a woman got up from her desk as I said “Bald eagle nestwatch application.” She didn’t hesitate, grabbed it from my hand took several fast steps and time punched my submittal on a machine in the back corner of the office. She then looked at the time stamp and exclaimed to me that I had 30 seconds left! She went on to say that never in all the years of this project had anyone ever come in so close to the wire. Note to self…this happens to be a recurring theme in my life…being somewhere, being someone…and in heartbeat everything can change. I find myself on a different path, redefining or should I say refining my self. Several weeks later, I was in. I was a Bald Eagle Nestwatcher. The story begins with Anna and San Carlos and eagles and spirits in the night and …Miss Pickle.